On Tuesday we put up our Christmas tree and decorations. I had totally forgot that last year we bought our first proper tree (before we had a hand me down one). It's 7ft 6inches and is one that you have to put each branch in individually so I was cursing my past self for getting such a big tree that took loads of effort to put up. That being said, we had a great time putting it up. Indie loved helping put the branches on and was so excited and kept shouting 'tree'. I took loads of photos because this is the first year where Indie can stand and take part too, these are memories that I'll treasure forever. We decorated the tree and put up some lights around the living room and Indie loves it. 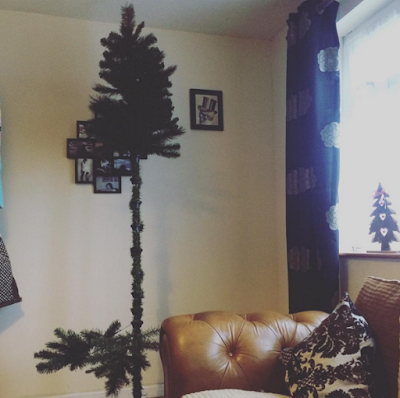 Everytime somebody comes round she is eager to show them her tree. She's now claimed the sofa seat nearest to it. I can't wait for this Christmas Day and I love the run up to Christmas in general. I think the colder weather is the perfect excuse to spend some quality family time at home together and I love venturing out to do Christmassy things. When Indie was born we decided to buy her a Christmas tree decoration every year so that she has a lovely collection for when she leaves home as an adult. For her first Christmas last year she was given a beautiful engraved heart (it's in the middle of the tree in the 3rd picture) and says 'Indie's First Christmas' and so we are really looking forward to going out over the next few weeks and letting Indie pick her second decoration. What traditions are you starting with your little ones this year?